In the first autumn of World War I, a German infantryman from the 25th Reserve Division sent this pithy greeting to his children in Schwarzenberg, Saxony. How are you doing? Listen to your mother and grandmother and mind your manners. He scrawled the message in looping script on the back of a Feldpostkarte, or field postcard, one that had been designed for the Bahlsen cookie company by the German artist and illustrator Änne Koken. 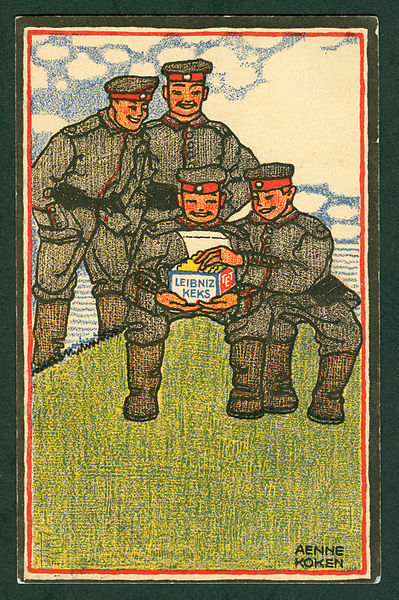 On the front side of the postcard, four smiling German soldiers share a box of Leibniz butter cookies as they stand on a grassy, sun-stippled outpost. The warm yellow pigment of the rectangular sweets seems to emanate from the opened care package, flushing the cheeks of the assembled soldiers with a rosy tint. Änne Koken, color lithographic postcard (Feldpostkarte) designed for the H. Bahlsen Keksfabrik, Hannover, ca. November 1914. Public domain via Wikimedia Commons. German citizens posted an average of nearly 10 million pieces of mail to the front during each day of World War I, and German service members sent over 6 million pieces in return; postcards comprised well over half of these items of correspondence. For active duty soldiers, postage was free of charge. Postcards thus formed a central and a portable component of wartime visual culture, a network of images in which patriotic, sentimental, and nationalistic postcards formed the dominant narrative — with key moments of resistance dispatched from artists and amateurs serving at the front. The first postcards were permitted by the Austrian postal service in 1869 and in Germany one year later. (The Post Office Act of 1870 allowed for the first postcards to be sold in Great Britain; the United States followed suit in 1873.) Over the next four decades, Germany emerged as a leader in the design and printing of colorful picture postcards, which ranged from picturesque landscapes to tinted photographs of famous monuments and landmarks. Many of the earliest propaganda postcards, at the turn of the twentieth century, reproduced cartoons and caricatures from popular German humor magazines such as Simplicissimus, a politically progressive journal that moved toward an increasingly reactionary position during and after World War I. Indeed, the majority of postcards produced and exchanged between 1914 and 1918 adopted a sentimental style that matched the so-called “hurrah kitsch” of German official propaganda. Walter Georgi, Engineers Building a Bridge, 1915. Color lithographic postcard (Feldpostkarte) designed for the H. Bahlsen Keksfabrik, Hannover. Public domain via Wikimedia Commons. Beginning in 1914, the German artist and Karlsruhe Academy professor Walter Georgi produced 24 patriotic Feldpostkarten for the Bahlsen cookie company in Hannover. 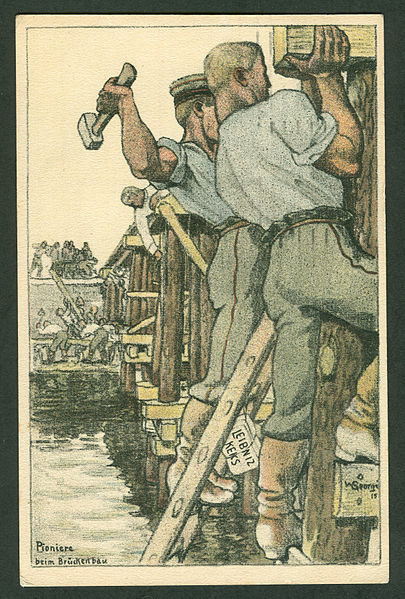 In a postcard titled Engineers Building a Bridge (1915), a pair of strong-armed sappers set to work on a wooden trestle while a packet of Leibniz butter cookies dangle conspicuously alongside their work boots. These engineering troops prepared the German military for the more static form of combat that followed the “Race to the Sea” in the fall of 1914; they dug and fortified trenches and bunkers, built bridges, and developed and tested new weapons — from mines and hand grenades to flamethrowers and, eventually, poison gas. Georgi’s postcard designs for the Bahlsen company deploy the elegant color lithography he had practiced as a frequent contributor to the Munich Art Nouveau journal Jugend (see Die Scholle).In another Bahlsen postcard titled “Hold Out in the Roaring Storm” (1914), Georgi depicted a group of soldiers wearing the distinctive spiked helmets of the Prussian Army. Their leader calls out to his comrades with an open mouth, a rifle slung over his shoulder, and a square package of Leibniz Keks looped through his pinkie finger. In a curious touch that is typical of First World War German patriotic postcards, both the long-barreled rifles and the soldier’s helmets are festooned with puffy pink and carmine flowers. These lavishly illustrated field postcards, designed by artists and produced for private industry, could be purchased throughout Germany and mailed, traded, or collected in albums to express solidarity with loved ones in active duty. The German government also issued non-pictorial Feldpostkarten to its soldiers as an alternate and officially sanctioned means of communication. For artists serving at the front, these 4” x 6” blank cards provided a cheap and ready testing ground at a time when sketchbooks and other materials were in short supply. The German painter Otto Schubert dispatched scores of elegant watercolor sketches from sites along the Western Front; Otto Dix, likewise, sent hundreds of illustrated field postcards to Helene Jakob, the Dresden telephone operator he referred to as his “like-minded companion,” between June 1915 and September 1918. These sketches (see Rüdiger, Ulrike, ed. Grüsse aus dem Krieg: die Feldpostkarten der Otto-Dix-Sammlung in der Kunstgalerie Gera, Kunstgalerie Gera 1991) convey details both minute and panoramic, from the crowded trenches to the ruined fields and landmarks of France and Belgium. Often, their flip sides contain short greetings or cryptic lines of poetry written in both German and Esperanto. Dix enlisted for service in 1914 and saw front line action during the Battle of the Somme, in August 1916, one of the largest and costliest offensives of World War I that spanned nearly five months and resulted in casualties numbering more than one million. By September of 1918, the artist had been promoted to staff sergeant and was recovering from injuries at a field hospital near the Western Front. He sent one of his final postcard greetings to Helene Jakob on the reverse side of a self-portrait photograph, in which he stands with visibly bandaged legs and one hand resting on his hip. Dix begins the greeting in Esperanto, but quickly shifts to German to report on his condition: “I’ve been released from the hospital but remain here until the 28th on a course of duty. I’m sending you a photograph, though not an especially good one. Heartfelt greetings, your Dix.” Just two months later, the First World War ended in German defeat. 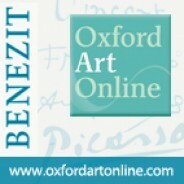 Shannon Connelly writes on art, politics, and visual culture in 20th century Germany. She holds a PhD in art history from Rutgers University and has been the recipient of dissertation fellowships from the Andrew W. Mellon Foundation, the Dedalus Foundation, and the DAAD.